This has been such a great weekend! This is our room. We had the ABSOLUTE best view of the city. See? That’s the river in the background. I wrote yesterday about day 1 of the trip. We went to see Reba and George Straight…awesome! You can go here to read it. Saturday, we ate pretty much all day. I LOVE Cajun food. I wasn’t a big fan until I started dating Noah, who grew up on it. He converted me pretty quickly! 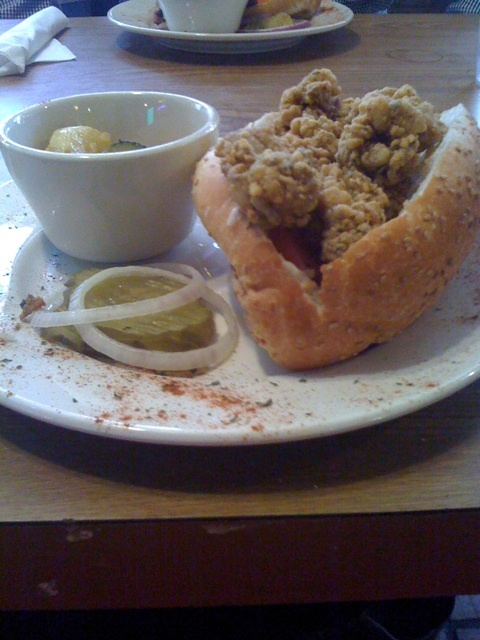 This was probably the best Po Boy I’ve ever had. Oh, and the raw oysters. I know some people think they’re gross, but I’ve literally been eating these since I was a baby. SO good with a cracker and some cocktail sauce! Last night, we went to the Eric Clapton concert. He’s one of our favorites – the first dance at our wedding was Wonderful Tonight, and probably my favorite song of all time is Layla. It was AMAZING – seriously, if you’re a fan, go see him live. He is awesome!